We arrived at KL airport at about 3pm local time (an hour ahead of Thailand) and at once looked for Alli (our friend from Camp Sloane), who had flown in an hour before us. However, after a few minutes of searching, we soon realised that she was at a different terminal…error! Thankfully the airport had free WiFi, so we soon located her and headed over to where she was before jumping in a taxi and making our way to our hostel, the wonderful Matahari Lodge. Once we’d settled into our two rooms (one for Rosa and I, one for Alli and Maritza) it was time for some food. After a quick wander through the nearby market, we found a yummy place to eat and catch up on all our adventures so far. Next it was time to hit the bars, and luckily we passed a guy handing out flyers for the Reggae Bar around the corner, advertising cheap drinks for ladies night! 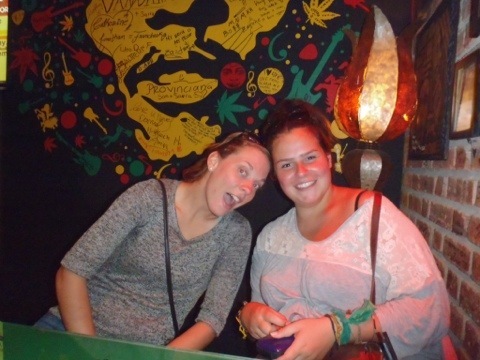 The Reggae Bar was exactly as you’d imagine it to be…with photos of Bob Marley all over the walls and his music blaring through the speakers…a great place to chill with some beers, play some pool and make a few new friends. After quite a heavy night, we woke up pretty late. Luckily our hostel served breakfast until 12:30pm, so after a few coffees and slices of toast we were ready to explore the city. Our first port of call was the Central Market, where we somehow found ourselves sitting with our feet in a bath of water, with (pretty big) fish nibbling at our toes…needless to say, with my ticklish feet, I didn’t particularly enjoy this activity! Next up if was time to head back to the street market from the night before for a few cheap purchases of sunglasses, watches and headphones. 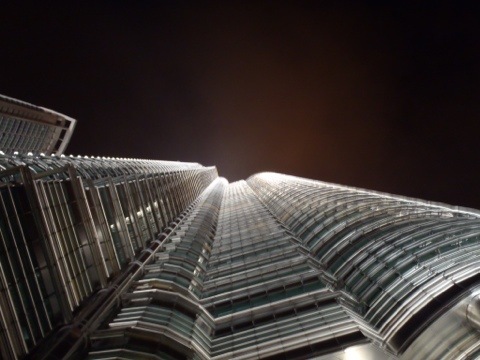 Our next port of call was the Petronas Towers (or ‘Twin Towers’), a magnificent sight, reaching high into the sky. Inside, however was a different story…a giant shopping mall, maybe the biggest I’ve ever seen, stretched upwards and outwards in all directions. We wandered around for a bit, but then became a little overwhelmed by all the Christmas shoppers, so headed upstairs to the food court for some dinner before making our way to the cinema up on the next level to while away some hours watching the newly released ‘New Years Eve‘. By the time it was finished we were all pretty tired, so it was back to the hostel for some internet time and general chilling before bed. The next morning, feeling refreshed after a nice long sleep, we headed out fairly early to the Butterfly Park, where there were some pretty awesome creatures floating around…now I’m not a huge fan of things that fly at me, so spent the whole time a little bit on edge, but the others seemed to enjoy it…don’t ask me why?! 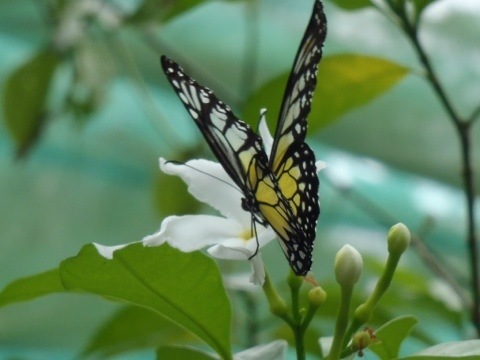 It turns out that hiding from butterflies makes pretty hungry work, so we made our way over to little India for some delicious (but very spicy) food…at one point I thought my face was going to burn off…it really was that hot! On our way back to the hostel, we got caught in some pretty heavy rain, and by the time we got back we must have looked an absolute state…we decided it was time to hit the Reggae Bar again for our last night together in KL. I awoke the next morning at 8:06am…nearly 45 minutes after my alarm was supposed to go off…it turns out that cheap, fake watches are not to be trusted! After a rushed shower and breakfast, Rosa and I said our goodbyes to Maritza and Alli and headed to the airport to get our flight to Singapore. At about 1:30pm we landed in country number 6 and by about 3pm we were at our hostel…the wonderful Beary Nice! Hostel in Chinatown. It was a great place…really clean and chilled, and after grabbing a quick bite to eat at a nearby street restaurant, we settled down for the night, watching one of the many DVDs available on the hostel’s flat screen TV. On our last day in SE Asia (sob! ), we got up early and checked out, leaving our bags in the hostel while we headed out into the city to see some of the sights. 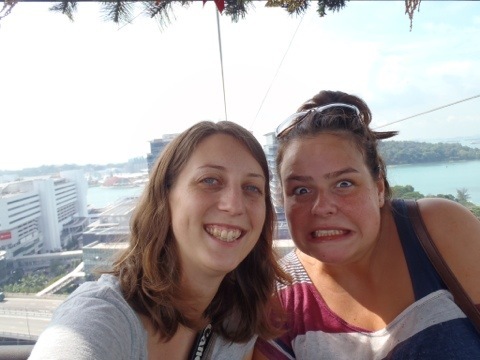 We figured the best way to do this would be to take a ride in on of Singapore’s main attractions…the cable car ride. The views were absolutely incredible, and even though there wasn’t much going on at the other side, it was still a pretty fun outing, one I would definitely recommend. If you get the cable car in the other direction, it takes you to Sentosa Island, which has been turned into a theme park and absolute tourist trap…we decided against that one! After the cable car ride we couldn’t really decide what to do next, since we only had a coupe of hours before we had to go get our bags from the hostel and make our way back to the airport. We were pretty tired (that’s what you get when the man in the next bed over in your dorm room snores really loudly all night), so went to Plaza Sungapora, one of the city’s many shopping malls, and sat in a dark room for two hours watching the new ‘Mission Impossible‘ movie…a great way to while away the time. Then it was time to pick up our bags and off to the airport we went to catch our plane to Melbourne…Australia here we come. SE Asia, it’s been a blast!